Every Christmas morning I always do my best to make a batch of homemade breakfast rolls. I’ve made a number of variations – typically using fresh citrus from the yard. Cinnamon makes an appearance from time to time too. 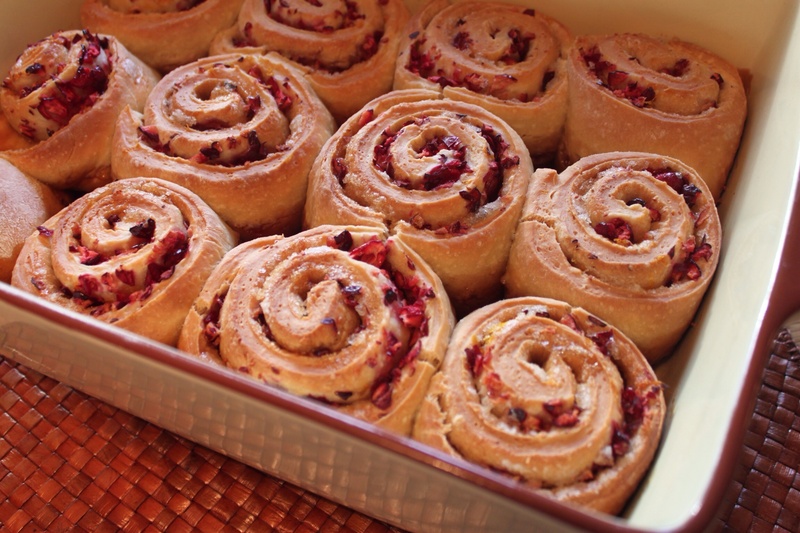 I fell in love with the color of these cranberry sweet rolls. And cranberries are also seasonal and festive. Their tart flavor adds a nice balance to the sweetness of the brown sugar. Orange zest compliments all the flavors and reminded my family that a Florida Christmas is special and unique. With a fire in the fireplace, Christmas tree lit – you can still gaze outside at Spanish moss, grapefruit and lemon trees and lots of Sunshine. I hope you had as sweet of a Christmas as I did. More Christmas recipes and photos tomorrow! I was just looking at this recipe thinking I was gonna make the apple version. Your’s look delish!